FoodCoin Ecosystem keeps spreading among real food businesses. Germany-based Сompany ALDIM GmbH, producer of preserved food, has joined the Ecosystem in March of 2018. They are the largest manufacturer of bio food, and their products can be found on the groceries of many countries of Europe, Asia, Americas, Australia and New Zealand. Its produce will soon be purchasable with FoodCoins, and the FoodCoin blockchain will be implemented to optimize the supply chain. The goods with Сompany ALDIM GmbH trademarks will soon be purchasable on 1000ecofarms platform, where FoodCoin will be available for payment. In addition to FOOD tokens (which are going to become coins soon), the company will also adopt FoodCoin Ecosystem blockchain to optimize their supply chain. It means that the quality of the products made by Сompany ALDIM GmbH will be technically proven, and every consumer will be sure that raw materials and the final products comply claimed quality and composition. “New technologies must always be used, that is why I have made this decision. I see that it provides two tools: one for businesses and other for customers. A customer will always want to be sure that a producer is not a “fly-by-night operation”, and its product is made in good conditions. Blockchain is a good help for quality assurance. It frequently happens when you order goods, which are claimed being ecological and certified, but upon paying the money and receiving it, you realize that it is some cheap buckwheat with a certificate drawn just for the customs. Blockchain is like an electronic quality office, but more trusted, as even the strictest regulatory body cannot check everything. The most important thing for them is the filled documentation, and the product itself can be ignored. It is also convenient for the producers, as they do not have to check everything, call or send messengers somewhere and assure the quality themselves. This platform links people, which you do not know personally with so-called “proven-trust”. I do not think that the scammers will succeed in sneaking into this platform. That is what makes it convenient for us. Using blockchain-based systems such as PRORID, DIGID and DiPay that FoodCoin Ecosystem provides, will help to link together everyone in the supply chain, simplify the checks and payments. ALDIM has complex supply chains, as they have suppliers through all the Europe, and buyers from all over the world. All these supply chains will be integrated with blockchain and smart contracts based on FoodCoin Ecosystem. PRORID system will provide additional protection from counterfeited raw and processed products. 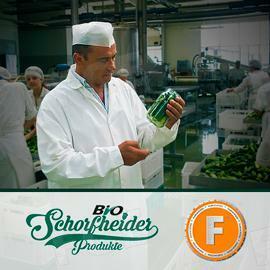 Thus, in addition to the eco-drink of The Turmeric Company and honey from Krasnodar region and other products from 1000ecofarms, the users will be able to purchase Schorfheider preserves, pickled products and sauces. Also, other food producers, such as farmers from US, will soon join the FoodCoin blockchain, and we will tell about it as well.